Contact with nature has a positive impact on children’s learning, health, and behavior. 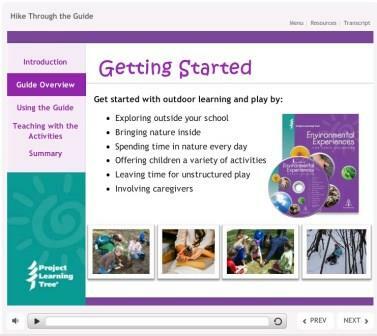 Project Learning Tree’s (PLT) award-winning early childhood materials help you foster young children’s wonder and curiosity about the natural world as you safely take your young learners outdoors and bring nature into the classroom. In addition, PLT’s early childhood materials teach reading, writing, science, and many more important skills to young learners. PLT’s new online workshop consists of 5 self-paced online coursels (each a 20–30-minute learning experience) with simulations and videos that model PLT’s early childhood activities, along with accompanying planning worksheets that provide guidance and support for you to try out PLT activities with children in your context. To access the course, visit our online store at shop.plt.org. Engage your learners in experiencing nature, both outside and indoors. Make learning and teaching fun with hands-on activities. Teach core topics (especially reading, writing, science, math, and gross and fine motor skills). Meet learning standards (including the National Association for the Education of Young Children Standards and the Head Start Child Outcomes Framework). Easily incorporate activities into your existing lessons. Meet your professional development requirements. Become eligible to receive a PLT GreenWorks! grant to fund projects for your students. This professional development experience will teach you how to use PLT’s materials effectively in your own educational setting and how to access many additional resources. An electronic copy of PLT’s Environmental Experiences for Early Childhood activity guide and music. Access to a self-paced online workshop (approximately 3 hours). The Environmental Experiences for Early Childhood e-guide contains over 130 experiences that engage children ages 3 to 6 in outdoor exploration and play, and downloadable music files that encourage children to sing, dance, and move. A print version of the guide and music CD are available for an additional fee. 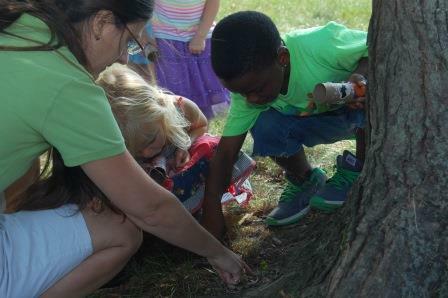 Topics include exploring nature with five senses, meeting neighborhood trees, and experiencing trees through the seasons. The workshop can be completed during your own time, wherever you are, as long as you have internet access. It provides useful links to online resources, state-specific resources, and 5 coursels which are 20–30-minute self-paced learning experiences that make up the larger course. In other words, a coursel is a morsel of a course! Exercises and worksheets will help you plan and facilitate group experiences with early learners, and design environmental experiences that maximize their use of 6 types of Learning Centers found in your Environmental Experiences for Early Childhoodactivity guide. Let PLT help you foster the curiosity that young children have about the natural world! 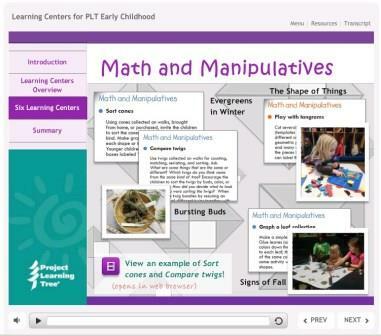 To access Project Learning Tree’s online training for Early Childhood, go to shop.plt.org. Find an in-person Early Childhood professional development workshop offered in your state.